SAMSUNG launches Galaxy S8 Active with 5.8-inch shatter-resistant screen. Samsung today announces the launch of Galaxy S8 Active, a rugged and durable smartphone available at AT&T on Aug. 8. Starting tomorrow, AT&T customers can visit att.com/galaxys8active to pre-order the new Samsung Galaxy S8 Active. Designed around a metal frame with an improved, rugged structure, this device is shock-, shatter-, water-, and dust-resistant. A shatter-resistant screen on the Galaxy S8 Active provides a protective layer for the 5.8-inch Quad HD Super AMOLED display. The screen's 18.5:9 aspect ratio provides an expansive display making the device easier to hold, so you can enjoy bright, vivid colors while watching your favorite shows and movies on DIRECTV NOW. This smartphone is built to withstand almost anything with its military-grade, dust and water-resistance body and shatter resistant screen. Bixby is a smarter way to use your Galaxy S8 Active with an intelligent interface that learns from you to help you get more done. Bixby includes intelligent vision, voice, a personalized home page and smart reminders. It’s like having a personal and intelligent voice assistant at your fingertips. With a simple swipe or press of a button, the Hello Bixby home screen greets you with quick access to active lifestyle features such as a stopwatch, barometer, compass, and flashlight. This makes Bixby a great companion for your outdoor adventures. 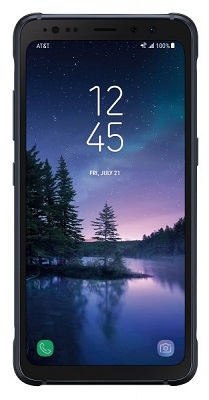 The new Galaxy S8 Active features an advanced 12MP F1.7 Dual Pixel rear camera and 8MP F1.7 Smart autofocus front camera that deliver bright, sharp photos, even in low-light conditions. It also features a long-lasting 4,000 mAh battery with wireless charging. The Galaxy S8 Active is secured from the "chip up" with Samsung Knox, the defense-grade mobile security platform designed to protect the integrity of the device. It also offers a selection of biometric features such as fingerprint and iris scanners. The Galaxy S8 Active from AT&T comes ready with the DIRECTV NOW app. That makes it easy for AT&T Unlimited Plus and AT&T Unlimited Choice customers to watch their favorite movies and shows on the brilliant, expansive 5.8-inch display for as little as $10 more a month, after a $25 a month video credit. AT&T NumberSync - Gives customers more ways to use their smartphone number on any compatible device, even when you don't have your phone handy. AT&T Wi-Fi Calling - Allows you to talk and text from almost anywhere you can get an active Wi-Fi connection. AT&T HD Voice - Provides crystal clear call quality with reduced background noise. AT&T Video Calling - Let's you make and receive HD Voice calls combined with real-time video. Advanced Messaging - Allows you to send high-resolution photos and larger video files, up to 10MB per attachment. AT&T Enhanced Push-to-Talk - Makes it possible for customers to quickly communicate with coworkers and work teams over 4G LTE and Wi-Fi. In addition, with HD Voice capable devices like the Galaxy S8 Active, you can download free apps like AT&T Mobile Security & Call Protect to help you gain more control over nuisance calls and help you avoid downloading unsafe apps and files. You can buy the Samsung Galaxy S8 Active on AT&T Next for $28.34 for 30 months when you have eligible service. Starting tomorrow, AT&T customers can visit att.com/galaxys8active to pre-order the new Samsung Galaxy S8 Active. The smartphone will be available in stores on Aug. 11 in either Meteor Gray or Titanium Gold. For a limited time, the latest Galaxy S8 Active device will be exclusively available from AT&T.